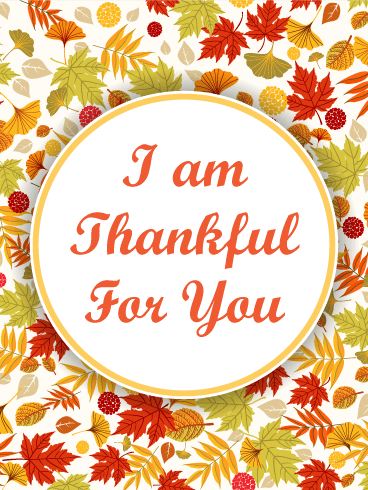 Thanksgiving is the perfect time to let someone special in your life know you're grateful for them each & every day. 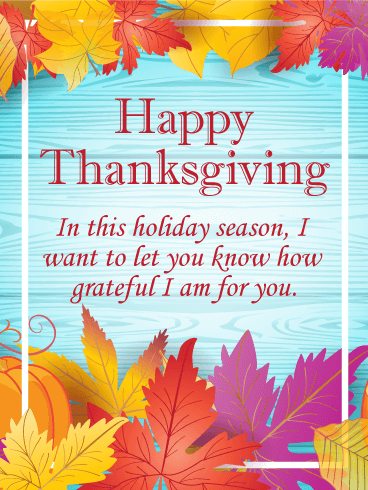 With its rich, fall colors and bold type, it's a more modern take on a traditional holiday card, but the heartfelt words are sure to make a big impact on family, friends, anyone you share this sentimental greeting with. 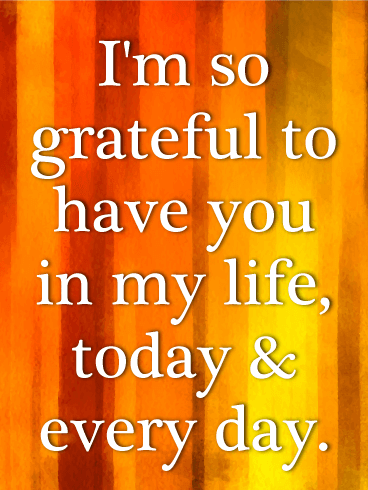 I'm so grateful to have you in my life, today & every day. 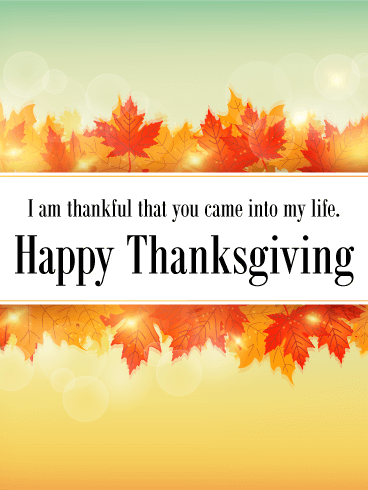 As you gather with family and friends to celebrate being thankful for all of the wonderful blessings in your life, why not let them know just how thankful you are to have them in your life? 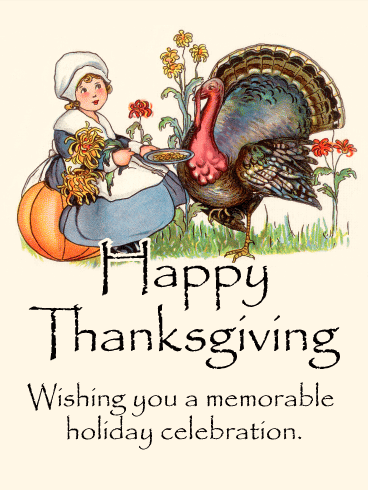 This colorful Thanksgiving card is the perfect way to do just that. It features a light blue background with autumn leaves of purple, red, and gold, along with a pumpkin to capture the beauty of the season. 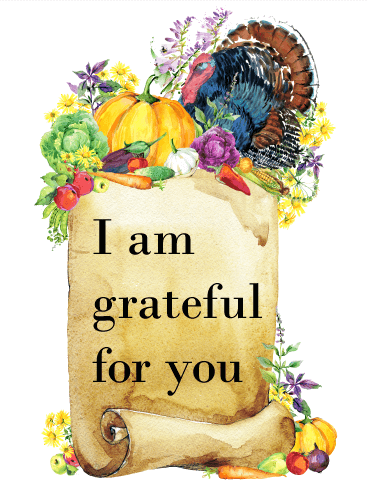 The sentiment of this Thanksgiving card may be simple, but it will mean so much to its recipient. 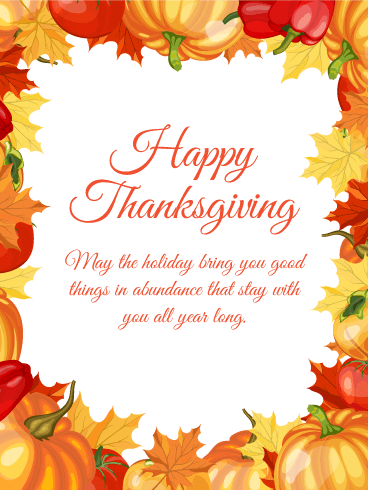 Whether your friends or family are near or far this holiday season, let them know how grateful you are to have them in your life with this sincere Thanksgiving card featuring autumn leaves in gold, orange, green, and red surrounding your heartfelt message. 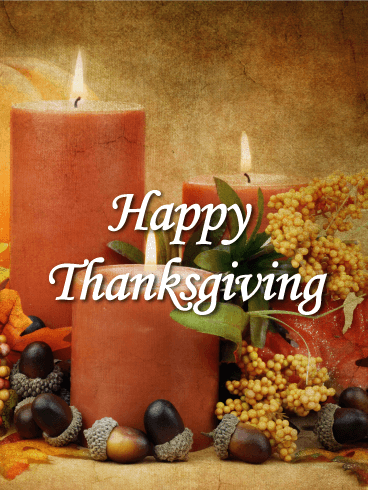 Whether your family and friends are near or far, you want their Thanksgiving to be filled with all of the joy and blessings this holiday can bring. 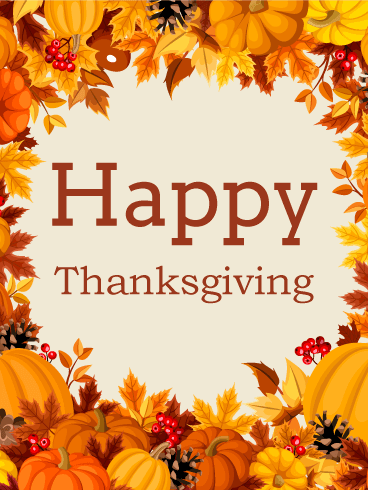 Thanksgiving is about being with those you care about, celebrating traditions, and being grateful for blessings. 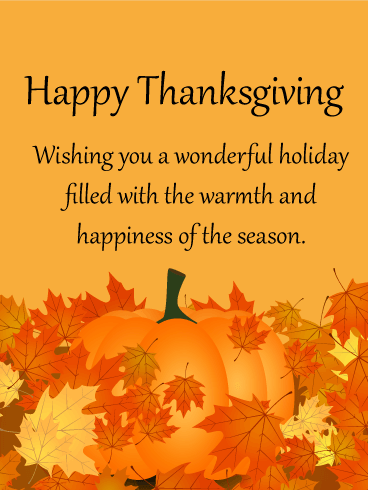 Let those you care about most know you wishing them a day filled with happiness with this Thanksgiving card. 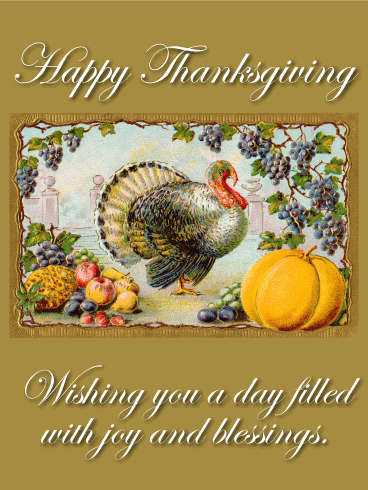 The warmth of the Thanksgiving season is reflected in this beautiful Thanksgiving card. A trio of classic candles is surrounded by acorns, yellow berries, and greenery set the scene for sending warm wishes to loved ones. 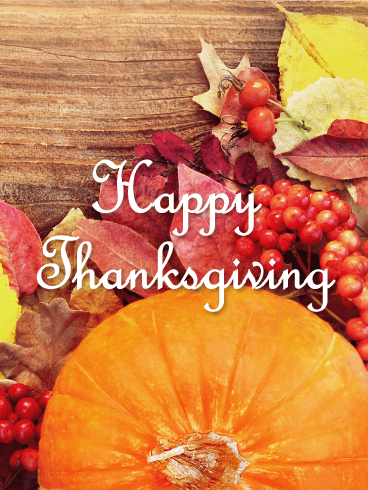 Let friends and family know just how grateful you are for them this Thanksgiving as you send your warmest wishes with this Thanksgiving card. We all learned in school that the first Thanksgiving was attended by the Pilgrims, and this retro Thanksgiving card hearkens back to that memory. A Pilgrim girl holding a plate of food is sitting on a large pumpkin next to an even bigger turkey in an adorable scene that will warm any heart. 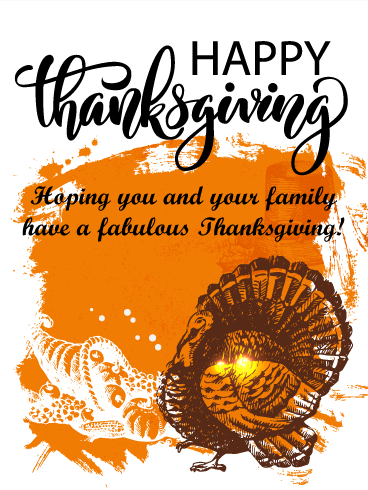 Holidays are for making memories, and with this Thanksgiving card you can wish your loved ones a memorable Thanksgiving.